Hey Girl, Guess Whose Face Is On My Daughter’s Retainer? 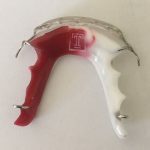 On the endless checklist of things to do before my daughter Leeannah left for college last month was to have her permanent retainer taken out and replaced with a removable one. Not exactly the most memorable or exciting of tasks, but one that had to be done. We made the appointment and a dental assistant made a model of her teeth and sent it off to a lab — in this case, Pasadena-based MJK Orthodontic Lab — but not before asking Leeannah what images she wanted on her retainer. As it turns out, like jeans, sneakers and the sweatshirts that are now called hoodies, retainers have been updated since the days when many of us had to wear them. They are now customized. Then there was the spider one kid requested. “It really creeped me out when I was making it because it was so real,” she admits. 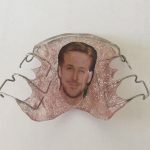 Yep, that’s Ryan Gosling on my daughter’s retainer. Still, nothing tops what my daughter half-jokingly requested: A pink sparkle retainer with Ryan Gosling’s face. “I was surprised. I didn’t think they would actually do it,” Leeannah says. But when she returned a month later to pick up her retainers, there he was, the much-ogled Canadian actor, smiling back from an acrylic sea of sparkles. “I have gotten more comments on that one than ever,” Loudenslager says. On an average day, she makes 10 to 15 retainers, or up to 60 retainers a week. Once she receives a model from an orthodontist, she bends wire to fit it and then uses what’s known as a “salt and pepper” technique, applying alternate layers of liquid and powder acrylic to create the retainer. For my daughter’s retainer, she found a photo of Gosling online, printed it on high quality paper and applied it between the layers of acrylic. “As long as the paper is sealed in the layers, it’s fine,” she says. She likes her job because of the flexibility; hers was the perfect career to have as she was raising three kids and now as she cares for her mother, who has Alzheimer’s disease. But the entrepreneur also appreciates the creativity of her work. “I was tickled when I got to do your daughter’s retainer,” she says. You can see Donna Loudenslager’s work on her Instagram @donnabennoit.